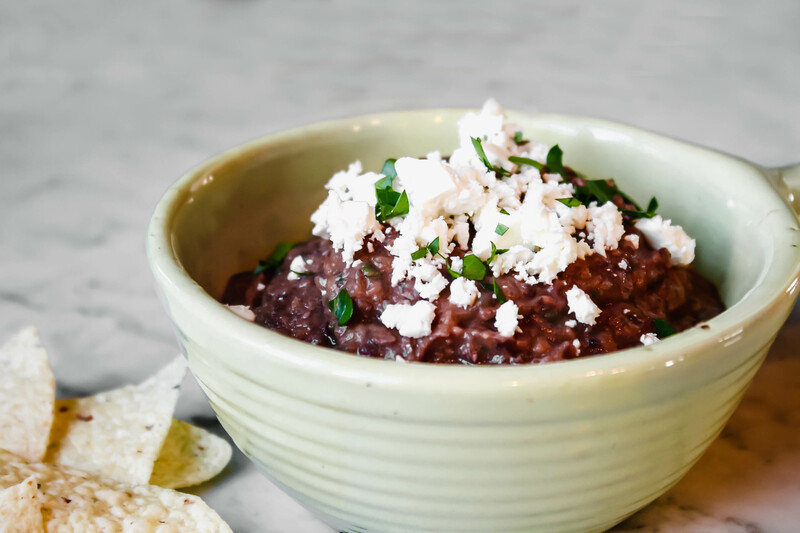 This Spicy Black Bean Dip is the result of enjoying a delicious and dip at a local restaurant. A few days after having it, I got a hankering to whir up my own. This 8-ingredient spicy black bean dip is creamy, spicy and incredibly flavorful thanks to cumin, coriander, garlic and parsley. Serve it with chips and veggies or use it to top your favorite Mexican dishes! 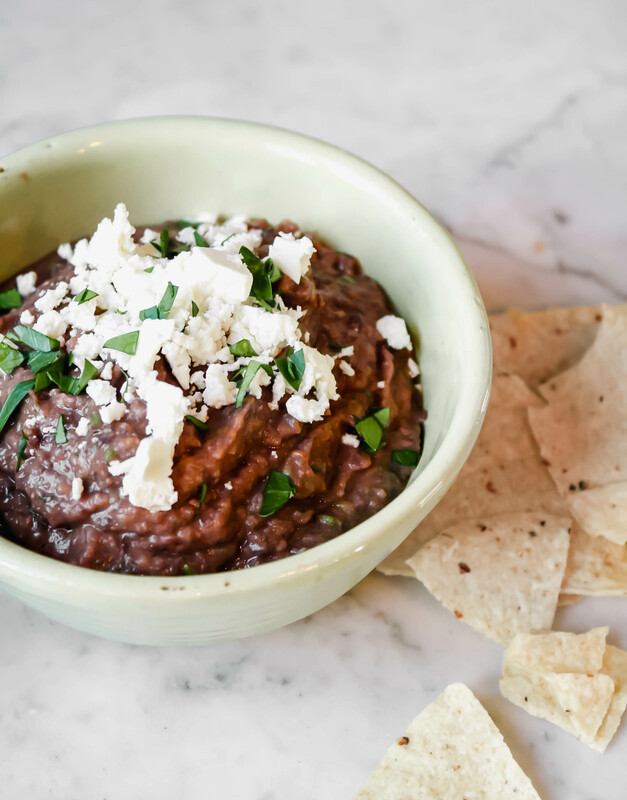 How do you make spicy black bean dip? 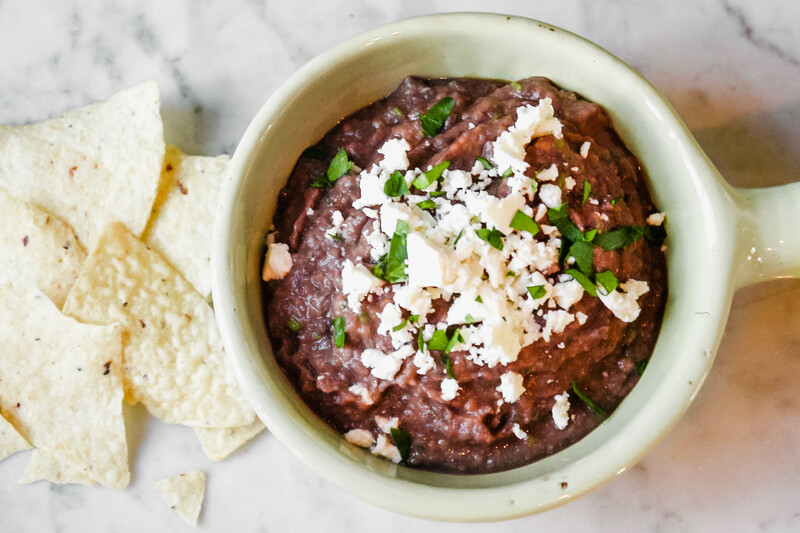 Beans: black beans, much like chickpeas, are the perfect base for a spicy dip. They’re a blank slate in flavor and offer an ideal creamy texture. Bring the heat: some classic hot sauce and jalapeno offer jus the right amount of heat. Add some flavor: coriander, cumin, parsley, onion, and garlic add familiar, yet undeniably delicious, flavors. Plus, you probably already have most of these on hand! on nachos with tomatoes, corn, chicken or tofu, cheese and avocado! tossed with chicken and cheese and sandwiched between two tortillas for a flavorful quesadilla. spread onto a tortilla and topped with an over-easy egg and some fresh pico—a quick huevos rancheros! top tacos with a dollop of this spicy black bean dip! Rinse and drain beans. Transfer beans to a food processor and add hot sauce, water, onion, garlic, jalapeño, cumin and coriander. Process for 2 minutes, scraping down sides of bowl as needed. Add parsley and process for an additional 30 seconds. Transfer dip to serving dish and garnish with crumbled feta and chopped parsley. Serve with corn chips or vegetables for dipping.